Great piece for the price. Sturdy construction. Easy to assemble. My teenage son loves the color and style. Assembly required. This product will ship to you in multipleboxes. Mattress, box spring, and bedding (comforter, sheets, pillows,etc.) are not included. Update the look of your bedroom with the Grain Wood Furniture Montauk Queen Solid Wood Panel Bed. This bed features a sturdy wood construction with a panel design in a driftwood, barnwood or rustic grey finishes. Dimensions 85.0 In. X 64.0 In. X 52.0 In. Have had the bed for 3 months now. 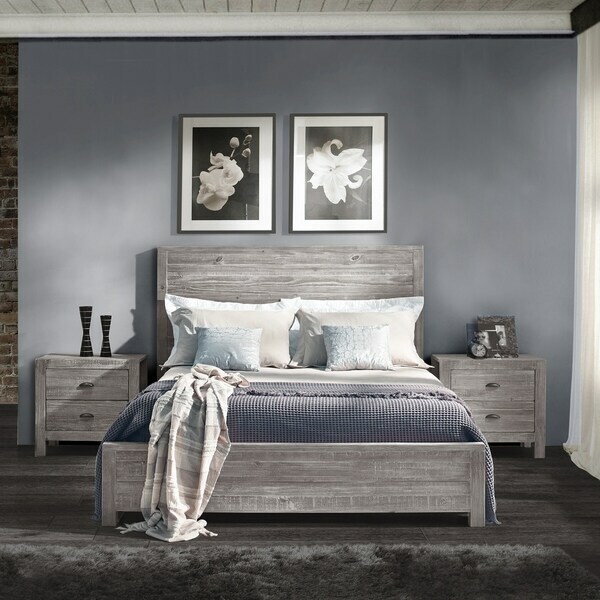 Bed itself is great, solid wood, color is true to picture on the internet (not sure why people were expecting a grey bed when ordering driftwood, it's true to it's colors in the isolate and closeup pictures in the gallery). Parts are heavy as a result of being real wood. The artificial weathering looks great. No issues from an aesthetic, structural, or durability standpoint. I expect this bed to be fine in 20 years. Only con is the slats are garbage. Only a few are provided and they are awkwardly cut and curved (not intentionally). The "foot" part of the slats are also low quality. Kind of surprised they are bundled with what would otherwise be a very high quality bed. Luckily, they are not a foundational piece of the bed, so I ordered metal slats on Amazon along with a 5inch DIY Metal Box spring. No creeks, moans, groans or shifting, even during night time "activities". I love this bed and guests always complement it. Just pulled the trigger on the dressers so I will review those after a month of use. I was initially attracted to this bed frame because of the distressed/reclaimed wood finish. Also, I was excited to learn it was constructed of real wood and super sturdy as well. The delivery was seamless, I set the thing up by myself within an hour (no power tools required yet highly recommended) and I love it! 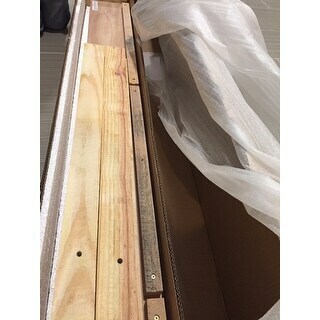 Quick note, if you've decided on a memory foam mattress to place inside this frame, the provided wood slats will not be enough to support it correctly, and it will in fact require an additional box spring. That said, overall this is an awesome product that has garnered the praise of both my family and friends. This is a great bed for our beachy theme. The wood seems solid and I like the white-washed finish, though it's just a bit leaning to pink. I did have to add some planks to support the mattress-only setup I chose. I think a regular sized box spring with a mattress would be too much, but a low-profile box spring or a thicker pillow-top mattress would be just right. I have an older 10-inch inner-spring mattress with a 3-inch topper on mine (with 5 extra slats I added) and it looks just fine. This bed is soooo easy to put together and it took my husband and I less that 1/2 hour to assemble it. I would recommend a box spring under the mattress or even a finished piece of plywood for more stability and support of the mattress. I waited until the bed was assembled and then measured the height that I wanted the box spring/mattress to be before ordering them. Glad that I did because there were no surprises when the bed was complete. The barn board wood is all wood and it has a distressed white wash to it. I typically gravitate toward darker woods but I thought I would try something different this time. So glad that I did. It is a very nice addition to my guest room and it will match anything. The matching nightstand completes the set nicely. We are very happy with the Montauk Queen Solid Wood Panel Bed. It is very sturdy bed and doesn't have any movement. To the touch, it feels like wood, not plastic like so many furniture pieces in this price range do now. It arrived on time and in perfect shape! Wonderful quality, easy to assemble, nice support for queen mattress. You will need standard box spring, not the low profile one. It has a high headboard. Nice bed. Solid wood but paint smells. From floor to the bottom of the box spring (if use) is about 14", twice high than I thought! I have a 15 inch mattress and using a IKEA "thin board" (about 2.5 inch high) . The bed end up really high, I have to jump to get on. Can some companies make lower profile bed for those thick memory foam mattress please?! The color is a little brighter. Almost looks like someone distressed the wood after being painted white. I thought the headboard was going to be slats of wood but it is actually just a solid piece ridged to looks like individual boards. The wood is beautiful. The craftsmanship is excellent. They use the locking mechanism for the side rails to the head & foot board just like they did for antiques. Love that! The Headboard is tall incase you need to know for a window. It looks just like the photo! Now if I can find a matching nightstand! The biggest thing I noticed about the bed while putting it together is that everything seemed to be measured incorrectly. The side rails of the bed don't lock into place - they just slide down until they're being forced into the headboard/footboard. After a little use they stick better but my bed was rattling and clacking the first couple of nights just from me shifting my weight around. Just don't expect to be able to pick the bed up by the sides, or the rails will pop off. I'm extremely lucky the rails lie parallel and the frame sits level; based on how the slats were mismeasured I was worried it would be tilted. The bed only comes with 4 slats, so no matter how you space or place them your mattress will sag without a box spring or other support. They are meant to hold your bedding off the ground and not to support a mattress on their own. This should be mentioned in the product description. I ended up having to order a mattress support separately online after the fact, and my mattress will be sagging and warping for a month before that comes in. 2 of my slats were too long and another was too short, and one of the slat supports was measured too long. The end result is that the mattress is sitting on an uneven surface. I'm worried what will happen when I finally do get a rigid mattress support. One of the screw holes on the slats was also dangerously close to the end of the board. It's only a matter of time before the screw breaks through the end of the board and the slat comes off the frame. Luckily the slats are basic pine beams so if you want extras or need a replacement you can probably go to your local home improvement store and get a few cut, or just buy the wood and do it yourself. The slats and headboard supports screw into finished wood, so screwing without power tools is difficult. About half of the screws didn't catch without a little hammering and encouragement. A better option would be to drill your own screw holes, but again, I don't have any power tools and you can't expect your customers to have them either. Despite all the problems, the frame does seem to sit level and it supports me and my fiancee without creaking or any groaning. Like I mentioned earlier, the rattling from the loose side rails went away after a few nights of having a few hundred pounds forcing them down. This bed looks good if you are going for a beach look. Its white washed light wood. It's fairly easy to assemble. Headboard is pretty tall and slats low so you need a tall mattress or combo matress box springs to make it look right. Material was durable however the color was not a rustic gray. It was a teal color. Awful. Not true to color at all. I had a full refund which unfortunately took multiple weeks, but overstock was extremely helpful and worked with me as much as possible. Do not buy if you are expecting to purchase this in the rustic gray color option. It will not be what you're expecting and does NOT look the way it does in the picture. Good and solid wood bed for the price. The factory distressing a little obvious up close, but overall look is nice. Only comes with four slats so had to order foundation for my foam mattress. Arrived moldy. Had to return. And had a terrible chemical smell which filled the apartment. It was attractive, if you don't mind mold and chemicals. Mattress with box spring is very high on this bed. Need a step stool just to get into bed. Wish I would have purchased a low profile box spring or a bunkie board to use. The product picture is for sure taken without a box spring...misleading since it’s not a platform bed. Super cute and high quality. Looks like the pictures and is completely worth the price. Beautiful piece of furniture.....many compliments. I am so impressed with this bed frame! I got it in the rustic off-white color for my daughter's room and it is the perfect color. The wood is extremely high quality and I love the finish on it. The wood is nice and smooth and feels like it will last a life time. Putting it together took no time at all, maybe 30-45 minutes and I did it myself. I think the style could fit well in a farmhouse, coastal, boho or many other styles. It's very versatile. I know we will have this piece for a long time. I like that is was easy to put together. I don't like that it is hard to have a memory foam mattress on it. It is pretty but there was a part where it was cracked although it seems to be okay. yes. I liked the furniture very much. Assembly was not difficult. "What kind of wood is this and how heavy/much does it weigh?" It is made of pine wood, it weights about 80lbs. "What is the clearance from the floor to the bed rails? 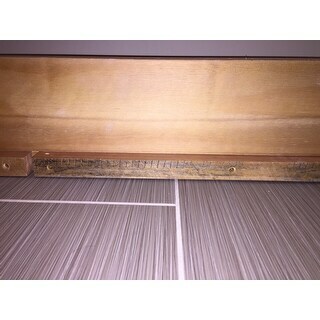 Looking to utilize underbed storage." It’s 7.5 inches under the side rails. "I’m looking for just the headboard just like this wood but have an adjustable base. Can I purchase just the headboard or do u have a suggestion on a bed that would work with an adjustable base?" Unfortunately, the headboard is not sold separately. "At what height does the mattress start?" The mattress will rest on slats that are 10 inches from the ground. "Why can't you put an adjustable bed frame inside this bedframe?" "Will this work with an adjustable bed?" We don’t recommend the use with adjustable beds. "What is the exact height of the headboard of the bed? and what box spring would you recommend low or high profile? Thank you."